Amarinth API 610 OH2 pumps ready for shipment to Schlumberger for use in the Dunga oil field, Kazakhstan. Amarinth has delivered API 610 OH2 pumps worth US$500 000 to Schlumberger which will be deployed on a process water treatment package in Kazakhstan’s Dunga oil field. 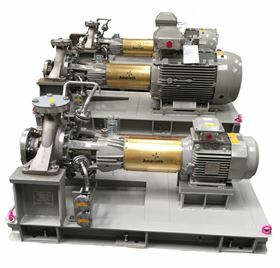 The order, for six API 610 OH2 super duplex stainless steel pumps, was the first that Schlumberger placed with Amarinth. The pumps were required on a very tight 26-week delivery. The Dunga field, operated by Maersk Oil, is an onshore development located 50 km north east of the town of Aktau on the east coast of the Caspian Sea in western Kazakhstan, and is currently producing around 15 000 barrels of oil per day. The pumps will operate in the challenging Kazakhstan environment that can see temperatures reach 45ºC in summer and -30ºC in winter. Amarinth has supplied pumps to other Maersk Oil projects over the years and so was already familiar with the company’s specifications. The UK company had also manufactured pumps for other fields in Kazakhstan.